«I decided to become an engineer, not a programmer, for that's not what I want. I shall work at the creation of a robot with artificial superintelligence. 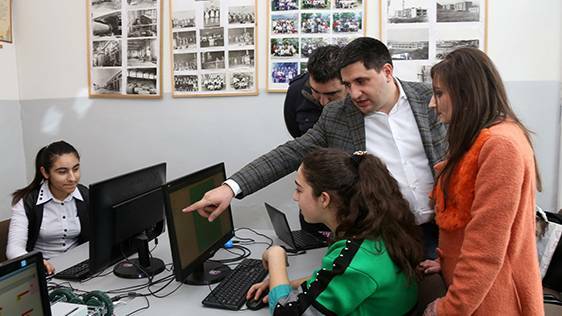 While working alone during my robotics courses I often failed, but when I united forces with my friend Garik, we succeeded», - convincingly says Edgar Ghalumyan, a student of “Armath” engineering laboratory of Azatamut secondary school in Tavush region, to the supporters of the project from Ucom and Union of the Information Technology Enterprises (UITE). The children acquiring engineering and programming skills in this laboratory, are mainly 6th-7th grade pupils, who try to apply their knowledge of algebra, geometry and physics. These children try to perform the computer modelling, printing of different items, programme games, create animations. Some of them demonstrated their abilities in a technological camp. «I want to become an architect and create buildings where the movement of people will be easier than ever», - dreams Garik Qamalyan, a student of the same laboratory. «In the long-term result of this corporate social responcibility project we should have a creative, inventive generation, the one useful for our homeland. It is important for these children to bring to life everything they told us about», - said Hayk Yesayan, Director General at «Ucom».